This multi-tool in my opinion needs re-designed. 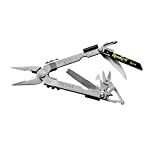 The pliers do not open wide enough to use on objects bigger than an inch and no can opener for those who go fishing, hunting or camping. You can't even get replaceable Rem-Grit blades. (even from the Gerber Co.) It does have great wire cutters & scissors though! Two stars is the best I feel to rate it. No wonder I stuck it in a drawer and wear a different brand! After all, a multi-tool that works on small objects of less than an inch when needed can be a nightmare! It is your choice & your money. Just try loosening a water hose on a faucet and then you'll find out about its limitations! I own six multitools (also custom Gerber 600, SOG Powerlock, a Bucktool, a Shrade Tough Tool and a Leatherman Wave) and I have to say that the Legend is the best one I own. The Legend has many good points. All of the tools lock and can be opened without opening the entire tool except for, of course, the pliers and wire cutters. The replaceable wire cutters are the best ones going. I have had wirecutters fail. On the Legend you just replace them. The handles are the most comfortable out there. They are the only spring loaded handles I have found. I especially like how the knife blade and Fiskars scissors have tabs to easily open them. The scissors cut better than any other. The short cutting area is made up by the superior cutting ability. I have cut plastic coated wire with no problem. The only disadvantage is there is no traditional can opener, just a bottle opener. I have large hands so the size is no problem for me but it may be for some. The Legend is the most expensive multitool I own but it is not much more than many others and it is worth the extra money. 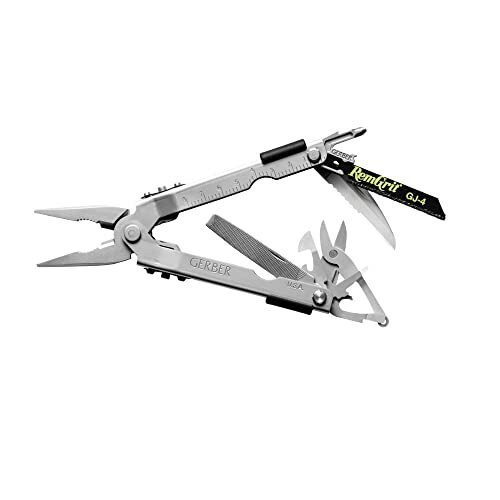 This multi tool is so good that I had to think to myself is this for real!The tool is almost half the original price and I say worth every penny for the whole price. The scissors cut through my jeans, the spring loaded pliers are great, and the locking mechanism is wonderful. It is perfect for my big hands and is light too. Lastly the wire cutters cut through anything as well as the remgrit saw blade which is REPLACEABLE!This tool is the best off all time and I would recommend this tool to any heavy duty worker. I love it and I think you will to. 2) you can't do the cool thing where you hold the multitool, flick your wrist, and the pliers extend with a satisfying little snap! It's also a bit larger than the 600, so unless you have big pockets or don't care about size, you might want to go for the more compact 600. Almost there, but not quite perfect. 3. The Gerber Pro Scout - stays on the boat. Of the first two (Swiss Tool and Gerber Legend), the Legend is probably a better design but not nearly as well executed as the Swiss Tool. The Swiss Tool is a thing of beauty, its build like a watch. The blades are much higher quality - same as you find on a swiss army knife. The Legend is a better design - the one handed opening would be huge on the swiss tool but the Legend's execution is just not to the same level as the swiss tool. I'm getting a tiny wear mark on the scissors from the way they store in the tool plus the locks can be painful if you have to use the knife and really bear down. I like this tool (Legend) for around the house projects. I especially like the one handed opening of the knife and scissors. Doesn't seem like much, but when you have what you need to cut in one hand, and you get your tool out with the other - it is incredibly useful. + strong, strong, strong pliers. + Great wire cutters. Excellent that they allow replacing the cutting edge. In my experience, this is where most multitools die when the edges get pitted and nicked. + good blade set of screwdrivers - 3 slotted, one phillips. + don't need to open tool to open blades. + Blades all lock in place. + spring loaded pliers - again very nice when you use them. - Case just doesn't cut it. Its cheap and I am constantly hooking the cover on things since it protrudes. Plan on finding another (not an easy task). This is a major beef. - I don't like serrated blades for most uses. They are hard to sharpen - so you don't and they get dull. This one has a blade that is half straight edge, half serrated - neither fish nor fowl. This and the case are my major issues with this tool. - saw seems like a good idea, but i would hate to cut anything of substance with it. - Its a large tool, so it can be a bit of a handful. Just got one of these for Christmas. It gets 5 stars for now because: You really can access the pliers with a flick of the wrist, you've just got to keep it oiled which you should do anyway. It is very lightweight, going unnoticed on the belt. Phillips head is the closest I've seen to a #2 in a multi-tool. It may not be a true #2 but others I've seen/used are clearly #1's. I don't know if giver purchased it from Amazon, I hope so. They're durable (the blade's still sharp 2 years later). It's very easy to handle and access all tools.The locking mechanism is the most obvious, safe, and easy to operate that I have seen on any multitool or utility knife. I've watched Leatherman owners futz with their tools for minutes while my gerber is at the ready in seconds. This thing has saved my arse many times, and I wouldn't leave home without it (if it weren't for the metal detectors and searches everywhere). But seriously, it's good in the lab and also whenever we're building a bad idea... the only thing I wish it had is reasonable wire strippers. I am in the Army and currently serving in Iraq. Being here I have received several different models of multi-tools by manufacturers such as SOG, Leatherman, Kershaw, and Gerber. This particular Gerber is by far my favorite and the only one that I brought from home. It contains the tools that I need most, and is at a size that I find comfortable to wear on my belt and it's being there does not interfere with the fit of my body armor or other equipment. I'm amazed at how often the scissors come in handy too. I thought that a goofy thing to have until I got this tool, and now I cannot imagine not having them handy. The pliers are just the right size for most jobs, and the cutters are just fine for cutting the bands off of equipment when needed. For my money Gerber has a winner here and if I ever lose this one I will replace it with the same model. I got one at ... & was happy after it was broken in. Of course it will break! I have two Gerber 400's, one with the tool kit. They are superb examples of size efficiency. The knives hold an edge better than most such tools. As such, they are HARDER steel than some other brands. Hard, thin steel do not like twisting. Buy a cheap kitchen knife [...] for pumpkins, or use a 'pumpkin saw' (which incidentially will also break if twisted). Other than that, the only advice I would give is to keep the 400's well-oiled. The sliding mechanism can bind- especially if used outdoors- unless you keep it oiled. This is explained in the flyer that comes with the tool. I was an Aerovac Medic for the US Air Force. I carried my Gerber with me as basic equipment. You don't have to peal open this tool, like a Leatherman. All you have to do is place it between your thumb and fore finger, flick your wrist, the pliars thrust out, and lock into place. It's great for one handed use. I used it many emergency situations. Great for cutting parachute cord, fixing medical equipment, cutting bandages, and eating MRE's. Fantastic Multi-use tool. The quality and design oriented toward the purpose of use during fishing is impeccable. Other Multi-tools may be good but this couldn't be any better. I fish all the time and this tool will be going with me. I have no aspect of this tool that I am not in approval of and I particularly like that the carbide/cobalt cutters can be replaced. Open pivot design allows comfortable, secure grip. Blade locks into position until manually released. I personally find the finger hole to be very uncomfortable. The inside is a thick tube shape, so it isn't shaped for a finger very well. Maybe it will work for you, but it sure didn't for me. The bolt lock is a neat idea, but the opening and closing is kind of rough. It just feels like a low quality knife. You should definitely see if your local "discount retailer" that starts with a "W" and ends in "al-mart" has one in stock so you can try it out before buying. This knife isn't very pretty. Either closed or open the knife just doesn't look "cool." However, this knife is very practical. It's size and Gerber quality make it a wonderful all purpose knife. It is impossible to fling the blade out, but, with practice, you can get used to gripping it correctly to open the knife with just your thumb. This is a knife you will have to take time to get used to using for some of the more general purposes of any pocket knife, but for a job that requires a lot of effort and control for an extended period of time this is the most comfortable knife I have ever used. If you take the time to get used to it, you can do some cool spinning tricks with it too. Of all the knives I have ever owned, this knife was my favorite. the main problem - it feels so cheap. there are no blade play, and lock hold for a time beeing bet action isn't smooth. It came well oiled, but still opening feels like there are some sand in it. Bottom line not the best knife for a price. my order was placed on dec. 24. 2 and 1/2 weeks later the arrival date was changed to jan. 28 - feb 10. This is Gerber's take at creating a CRKT KISS type knife, which is a minimilized folder. They blatantly copy Ed Haligan's design. You would think they could have made it more ergonomic. After a short session of use, one's hand gets extremely fatigued. The blade, which is too small to take advantage of it's half-serrated profile. It gives you the worst of both worlds. The serrations, as well as being possibly some of the least agressive ever, are too small to adequately cut even string. The tiny unserrated part of the blade has no belly, forcing the user to use only the tip, which eventually becomes worn and rounded. The blade is also made of 400 series stainless steel,which is mediocre at best, taking a decent edge quicly but loosing it just as fast. The lock is prone to failing under a heavy grip. It seems that if you want this type of knife, you should get the real thing. This is a nice small knife. The construction seems solid and precise. The edge gets some abuse if you carry it in your pocket with keys or coins though. To prevent this I carry it in the coin pocket of my jeans. It fits completely inside and is easy to get in and out. I recomend it. 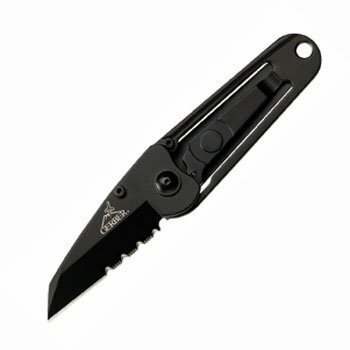 An excellent, compact knife that is stealth in appearance and extremely durable. It is affordable at under 25.00 dollars and small enough to be carried by anyone without the bulky look of a knife in your pocket. The blade is extremely sharp, however the patented lock back design reduces weight. There is a lanyard clip on the end to place a rope or keychain through. An excellent knife in a small, affordable package. Highly recommended. During the 10 months I have owned the Gerber07563 MP600 Pro I have found it to be a well designed usefull tool.Untill recently.I used the phillips screwdriver to remove a screw and to my astonishment it fractured in my hand wich disapointed me very much because i was led to believe that the tool.Was basically Industructable.Can you please inform me ware I can replace the tool.Thanking you for your quickest response. Gerber beats Leatherman hands down! 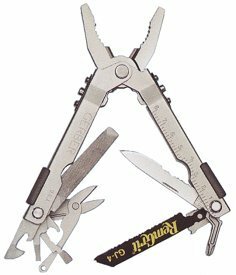 Paul Harvey can shill all he wants for Leatherman, but, having owned both this Gerber Pro-Scout and a comparable Leatherman, I must say Gerber beats Leatherman hands down. The Gerber is s-o-o much easier to use due to its design, and its quality is second to none. I've had my present Pro-Scout for several years, carry it on my hip nearly everywhere I go (except when flying or attending major sporting events; sadly, it falls into the "weapon" category since 9/11), use it at least a dozen times a day, and would feel somewhat incomplete without it. 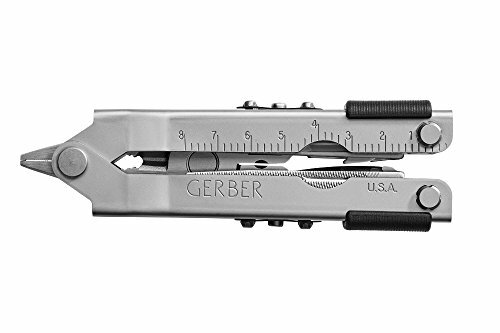 If you are looking to buy a *serious* multi-tool, give the Gerber a long, hard look. I personally don't think it will matter whether you try it out before or after the Leatherman. Either way, unless the Leatherman model has a tool you just can't live without, I honestly believe you will go with the Gerber. Simply put, if you use the knife blade a lot, go with the Leatherman Wave. That one has four separate locking blades (2 of them knives) that you can deploy without opening up the tool. If you can make do with one small (albeit really good) blade, then the Gerber 600 is better. Both of these tools (plus the SOG I've bought for a distant relative) are very well made. - What I find myself doing is not-so knife-intensive. - ALL the tools lock in place, whereas with the Leatherman, only the four blades do. The last thing I want is to be in a hurry (which you will be, if/when you need one of these instead of a full tool kit) and have the screwdriver fold on me. - As small as the single, half-serrated blade is, it's still a Gerber blade. Marketing or not, Gerber makes knives. Other companies just make little knives for their tools. - The scissors are of an incredibly simple design, and I can say that they cut like they are truly of Fiskars quality. - The extra tool kit (6 slotted/phillips bits) that I bought with my Gerber 600 fits neatly in the sheath, instead of in an extra box like the Leatherman's does. The adapter is a lot simpler, too. I highly recommend this little extra kit. - There's a ruler (3 in./8 cm) imprinted in the sides of the Gerber (none on the Leatherman). I thought this was just for show, basically, until I really needed it one day (at which point, it became invaluable). - You can replace the saw blade EASILY on the Gerber with standard (I forget the size) blades you can find at the hardware store. You don't have to take the tool apart to do so, either. The Gerber MP 600 Pro Scout doesn't have a lanyard loop, though. I have used the Gerber MP600 Pro-Scout continuously for several months, both at work and in the outdoors. 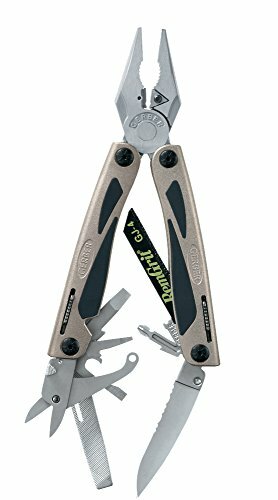 The Pro-Scout is about 5-1/16" closed, and slightly over 6-1/2" with the pliers open. The reason I purchased the Pro-Scout instead of the Leatherman or Victorinox is because it is larger and has what seems to be a more rugged design. Also, the addition of a metal cutting saw was another feature that I especially wanted. I have actually used the metal saw to cut a 1/4" diameter bolt in half, and while the saw took a beating, it did the job. I was more interested, however, in how the saw holder performed. I wanted to test the ability of the holder to sucessfully hold the saw in place, and not become worn or loose after some heavy use. I'm happy to say that the saw and holder performed well and did not deform. I have used all the other tools, and with the exception of the file, they have performed very well. If I had a choice, I would eliminate the file which is useless. Perhaps the file could be replaced with a wood saw or lanyard holder. The knife is extremely sharp. I don't care for serrated edges, but I have to say that the knife blade works well for cutting cardboard, rubber, rope, and whittling wood. The Pro-Scout comes with a black ballistic nylon sheath lined with what appears to be black Cambrell. In just five months of use, the lining has already begun to disintegrate and tear open. The sheath has a flimsy 1" wide strap sewn on the rear for a 2-1/4" wide belt. One of the problems with this design is that it allows the sheath to slip off and fall whenever the user's belt is loosened. With that said, the overall rating of this multitool is four stars. If Gerber improved the design of the sheath by adding a good clip and if the multitool itself had a useful file that actually worked, I would have to give it five stars. I had one of these until I lost it. I bought a SOG in the meantime (can't remember the actual model, but its the one where the pliers snap out when you push a button). Lusted for my Gerber ever since - the pliers are way better and there was a phillips screwdriver bit (can you believe not putting one of these in the tool?). Before I got my Gerber again, I looked at the leatherman tools - Wave and Juice models, and the swiss army tool. The reviews on the leaterhman looked good, and I really liked the juice, but their seems to be a problem with the wire cutters being of softer metal and that being a problem. I cut alot of wire and this would be an issue. The Juice models look really cool, but they are more pocket knives than multitools. Other than that, I think they will give swiss army knife users a serious alternative. But, as a multitool, they really aren't. I really liked the Swiss Tool from Victorinox. But, and I just couln't believe this, it didn't have a scissors! Yet every swiss army knife I have owned always has had one? Someone was really asleep at the switch on that one! The pliers on the Gerber do yeoman duty. They are tough, they open wide and you can really exert comfortable leverage. The ability to use the optional bit adaptor for any 1/4" bit is just way useful. The second most used blade on my tools are the screwdrivers and there never seems to be the right size - with this, it just isn't a problem anymore. You can get the PERFECT bit for the job and always have it with you. I also like the sheath better on the Gerber than for the SOG. But i do miss the ability to be able to clip it onto by belt instead of thread it. You would think there would be a great 3rd party tool sheath out there, but there really isn't (that meets my specs). - Serrated knife: For some reason, there seems to be an infatuation with multitool mfgs with serrated knives. They have a place, but boy, are they hard to sharpen. A sharp straight edge will do 90% of what a serrated blade will do and is far easier to sharpen and touch up. 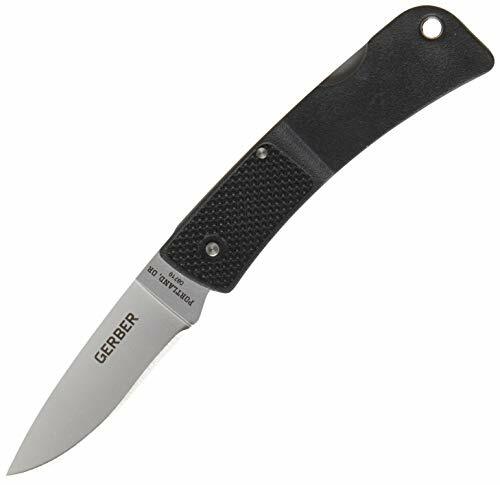 The Gerber has a half serrated knife and it would be much better if it were a straight edge. - Using the pliers is the most common use of this for me. However, it would be nicer if there was an easier way to get blades out without having to open the jaws first. This isn't a big deal, but it can get tricky. - I would like the sheath to have one of those hook style serious clip sheaths. If they substituted this on the vs the belt loop on the sheath, I would be happy. Everytime you undo the belt, the tool and sheath want to slide off and drop to the floor. Nothing wrong with it at all. It's a tiny little thing (about as big as a mini swiss army knife when closed) and it doesn't cost very much at all. Anyone that is disappointed was expecting too much. It weighs almost nothing at all, and at the very least makes a cool little addition to your keychain or a low-price gift. Very light, very small, very sharp. Just got mine, but after reading the reviews on this style of Gerber knife I was confident it would be of good quality, and it is. One thing I was a little unsure of when deciding to purchase was whether or not the blade would lock when open, it looks as though there is a release on the handle in the photo, but I wasn't certain. So, now that I have it I thought I would share that, yes, the blade does lock open. So now you know. Enjoy. This is a real nice knife. Sharp, lightweight, inexpensive, easy to open and close, fits in your watch pocket. I bought a Gerber Gator about 3 years ago. As an oudoors-y engineer, I've used and abused this knife an awful lot and haven't had to sharpen it much. The rubberized handle is great for use in bad weather, and really comfortable for extended periods of time. The gator is a thicker than most folding knives with similar blades, but still fits comfortably into a jean's pocket. It came with a nylon belt sheath, but it wore out quickly (because of increased friction from the rubber knife handle). Works well, but how do you carry it? This is a cool idea - allowing you to extend your tool usage immensely by adding any 1/4" bit to your tool. You can use torx bits, different phillips bits, slotted bits, star, square - you name it. The carrier is really a nicely done piece. The only problem is that my favorite Gerber multitool is the Legend 800. THis case included will only fit the pro scout and similiar tools. So, how do I carry it with my legend 800? Also would be nice if there was an adaptor for sockets so that you could use small 1/4" sockets too. How did I do without this thing before? 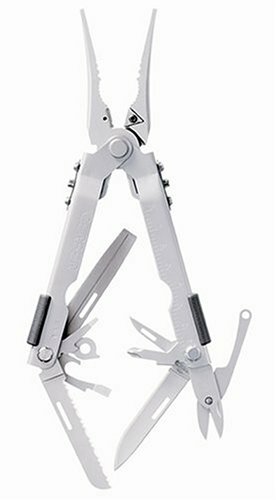 I purchased this multi tool while still working as a police officer. I can't tell you how many times it came in handy while working. Nothing earth-shattering, no great rescue stories, just something that was there every time I needed it, and did exactly what I wanted. Now that I'm retired, I still carry the tool around on my belt in the cordura case that came with the extra add-on tool kit. While I don't carry the extra tools anymore, I have found that a Swiss Army knife fits extremely well into the outer pocket of the double carry case and makes this an even more versatile tool. Whichever way you buy it, with or without the add-on tool kit, it is worth the money and is definately something to have. WORTH IT - IF you need to use odd sized screwdrivers. If you don't need odd-sized bits with you, you won't care for this. If you do, then you won't know how you got on without it. The real value of this accessory is a coupler that attaches to the end of the phillips part of your Gerber. The accessory comes with various bits, but if they're not what you need, the coupler holds standard bits. So, if you use odd bits in your line of work (say if you put laptops together) this can be endlessly useful. The little black rubbery bit holder keeps them all in line. The coupler also serves as a short extension to help you reach a little further. Just like with anything on a multi-tool, if you are doing heavy duty work you probably want to use a full size tool. However if you are a roving technician or need to have an odd bit with you for that unexpected problem, buy this. My tool kit has gotten plenty of use. The slight added bulk does not bother me. I purchased this tool kit as an addition to my Gerber Pro-Scout and was dissapointed. 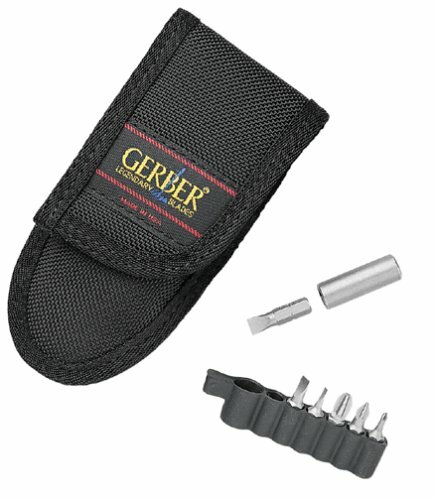 Some of the tools repeated or were simply slight modifications of the tools contained within the Gerber. One thing I like about my Gerber is how slim and unobtrusive the tool/pouch is on my belt. However, this pouch is a modification of the one included with a Gerber multi-tool, with a seperate area for the bits. When the bits are inserted it bulges out too much, making it seem like the pouch is not closed. 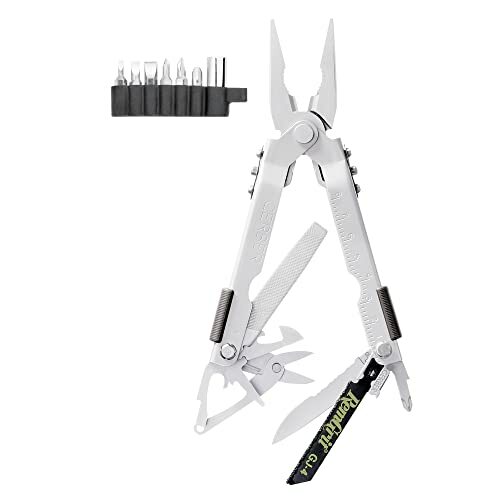 mfg by: Gerber Gerber's Multi-Plier 600 Series is simply the best multi-function tool available today. 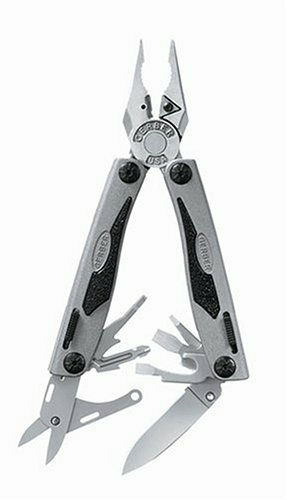 And the Blunt Nose version of the Multi-Plier 600 Series has no peer. 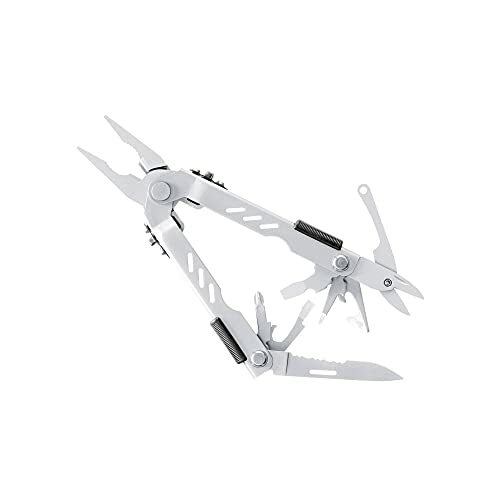 It has the strongest jaws of any multi-function tool available. 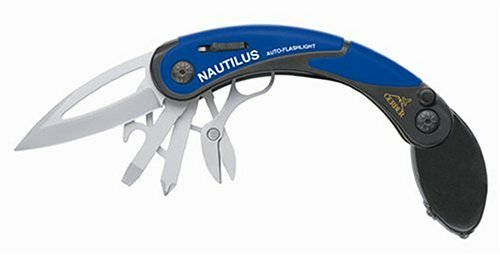 Like all Multi-Lock tools, the Blunt Nose has one-handed opening pliers, independent tool rotation, and all components lock in place. Made of stainless steel, the Blunt Nose is backed by a Limited Lifetime Warranty. 10 years old and as good as new! I bought this knife 10 years ago and I use it almost daily. It never leaves my pocket unless I'm using it. It holds an edge, is easy to open and close and it's small and light. The finger groves on the handle make it easy to hold when using it. Highly recommended.